Lake Erie Walleye, Smallmouth Bass and Yellow Perch fishing at it's finest aboard a 30' Island Hopper showcasing a 12' beam to provide comfort. 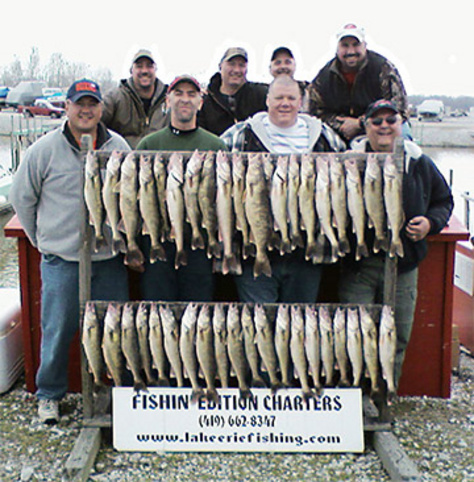 Lake Erie is known as the Walleye Capital of the World. Year in and year out it produces the finest fishing available. We are located in Meinke's West Marina Dock E -104, the Western most port on the Ohio side of Lake Erie for the spring and summer. We are subject to change ports in the fall to follow the fish. The walleye on Lake Erie go through an annual migration. Early spring and summer they are in the shallower water of Lake Erie. In the spring we will concentrate on the spawn. 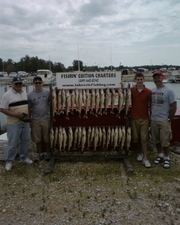 The walleyes are stacked along the shore of the Western Basin in the shallows along the Toledo Shipping Channel to the Reef Complex. We will drift for them using Hair Jigs tipped or not tipped with a minnow. We generally fish anywhere from 6 to 20 ft of water in this timeframe. As the water temperature starts to rise, the walleye start to migrate to deeper waters. It is then when we will change our method for capture. We will start to use Weapons and Bottom Bouncers tipped with a nightcrawler. The Weapon Rig simulates the Mayfly, which walleye love like candy. What this consists of is a weight with a single blade and beads on it. Sometimes we use one hook and sometimes two. We will use Colorado and Indiana Blades, just depends on what color and shape they want. The Bottom Bouncer , as we call it , consists of a longer lead and heavier weight. We will put these in rod holders along the side and let the boat do the work. We will try from time to time the weight forward program as well. Trolling with stinger spoons and husky jerks will produce fish . We will do that if we have too. Fishermen know Lake Erie as the Walleye Capital of the World , but tend to overlook the Smallmouth Bass Fishing. These footballs, as we call them out there, provide quite the entertainment when you hook them on your line. Many of them will go airborne out of the water. They provide the fishermen the thrill they are looking to seek when they come here to fish. There are two different ways we fish for Bass. One way is to drift fish. We will drift across different depths of water until we find a depth that is working.The other method is anchoring up for them. We will find a certain depth and throw the anchor out. There are three different baits that Smallmouth like. Their favorites are Softcraws and Big Minnows. We hook these up to a Carolina Rig with a weight above it. The other bait we use is called a Tube Jig. There are a variety of colors that we use for them. 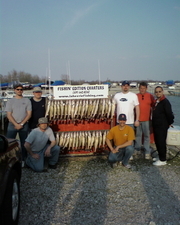 Yellow Perch fishing on Lake Erie is as good as it gets. The average size runs from 8 to 12 inches. The limit per person is 30. 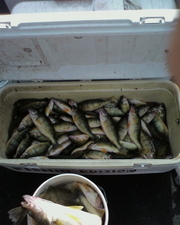 A cooler full of Yellow Perch will provide many quite tasty fish fries. 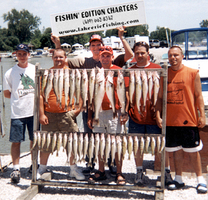 We anchor up for Yellow Perch and use dropper or spreader rigs with Lake Erie Emerald Shiners. Some days you catch a lot of doubles. Perch trips are the best time to get the family out. 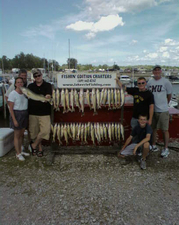 Whether what kind of fish you want, Lake Erie and Fishin' Edition Charters is where it's at. Make sure to follow us on Facebook during the season. We will post pictures and fishing reports. West Sister Charter Boat Assc.